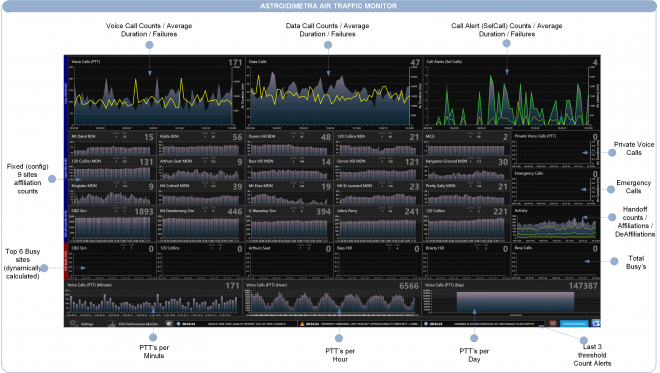 Visualize the performance, load and activity of your Motorola ASTRO or Dimetra radio network. View call performance for both data, data and emergency calls as they happen on the network and analyse call duration. Identify immediately call busy’s and sites affected by call busy conditions. See how mobile radios affiliate and de-affiliate across sites and across zones and monitor your most active sites at any time, at a glance. Plugin Statistics are compiled and presented as they happen every minute, hour, day and month and are visualized in a dashboard interface. Performance statistics provide a clear, non ambiguous view of performance across the radio data system, clearly identifying, to the minute, radio network failures and restorations. With NSM’s “replay anything, anytime” data models, there is unbiased performance history and easy to correlate event to performance trace-ability.